Our troops put their lives on the line for us every single day. They bravely sacrifice their comfort so that we can live peacefully, yet they are not deployed to combat with a pillow to sleep on. Instead, troops might sleep on rolled up towels or mesh. This basic item is so necessary but scarce among war zones. However, thanks to One Touch Awakening’s Project Pillows, troops can receive a comfortable pillow and know that they are not alone. These pillows serve as a connection from home with those who support and pray for them. 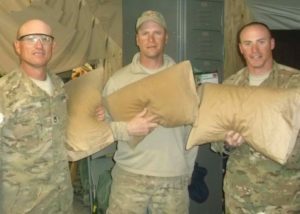 Project Pillows has sent over 7500 One Touch Pillows to troops serving in Iraq and Afghanistan. They are made in the USA and travel sized with a high quality pillowcase. Sam Houston TARS of Louisiana have raised money for the past four years for Project Pillows. In 2017 they raised $2,800 though bake sales and donations! 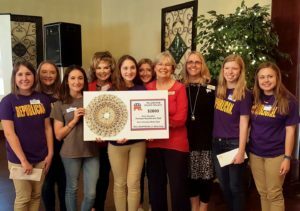 Sam Houston TARS raised $2,800! Part of Sam Houston TARS’ success is from participating in other military events. This helps them understand the cost of our freedom and causes them to raise money with enthusiasm. They have also invited their school’s Beta Club to participate in the project, allowing their fundraising potential to increase! Pillows can be sent in groups to be distributed through chaplains or to individual soldiers whose family has an APO address. 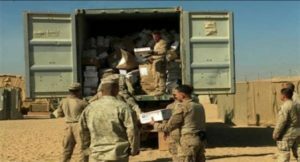 This is a project that can make a world of difference to our troops overseas! By working with One Touch Awakening, your TAR Club will receive a certificate stating that pillows have been sent to troops in your honor. Visit OneTouchAwakening.org/supporting-our-troops to get started!